Technology Q&A is a new series in which THP will be discussing the latest products with leaders in the golf equipment industry. The hope is that by sharing this information, golfers will be able to make more informed decisions by finding out what benefits the most current equipment can offer and who it is best suited for. 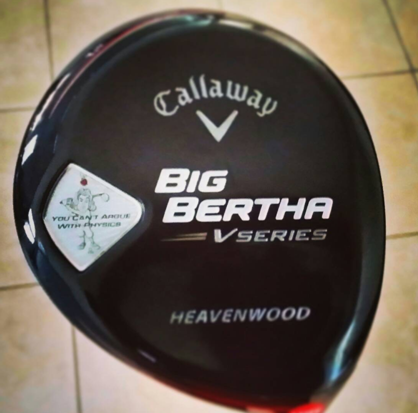 We recently had a chance to sit down with Jeff Newton from Callaway Golf to discuss the Big Bertha V Series Heavenwood. This club is part of the larger V Series release, but is unique in that it is designed with higher loft and a longer shaft than typical fairway woods. Jeff discusses why it’s designed the way it is and who it is designed for in this interview. THP: The original Heavenwood was introduced back in the 1990’s. It appears the name carried on into hybrids all the way up to around 2004. Tell us a little about that classic golf club and how it was received at the time. Jeff Newton, Callaway Golf: The original Heavenwood had the loft of a 7 wood (20 deg) and the length of a 4 wood (42.5”) and was one of the earliest examples of Callaway thinking outside the box to deliver a “demonstrably superior and pleasingly different” product. It was unique, it was versatile, and it was extremely fun to use so I think golfers will be excited to see this modern interpretation of the original. THP: What is unique about the Heavenwood concept and what kind of player is it designed for? Jeff Newton, Callaway Golf: The Heavenwood gives a unique combination of distance, control, and versatility and gives golfers a great alternative to conventional fairway woods. Generally, it is designed for players who struggle to hit lower lofted fairway woods off the ground but are still looking for maximum distance. THP: Talk about some of the modern technology that makes the V Series Heavenwood better than the original version. Jeff Newton, Callaway Golf: The V-Series Heavenwood is powered by a forged face cup using high strength Carpenter 455 stainless steel, which makes the face significantly thinner than the original for much higher ball speeds and longer distance. The center of gravity is also considerably lower than the original, which allows golfers to launch the ball high without generating too much backspin, which also contributes to greater distance. THP: What attributes does the V Series share with the original? Jeff Newton, Callaway Golf: The overall size/volume is quite a bit larger, as are most woods now compared to back then, but the basic configuration hasn’t really changed much – the loft is 20.5 deg vs. 20 deg and the length is 43” vs. 42.5”. THP: What feedback did you get from your product testers during development compared to something like the standard V Series 3w or 5w? What sort of differences were they seeing in height and distance? Was there a divide between low and high swing speed players? Jeff Newton, Callaway Golf: The feedback has been overwhelmingly positive. In our testing, the Heavenwood was more consistent than a standard 3w or 7w while achieving distances closer to the 3w. As with the original, the trajectory of the V-Series Heavenwood will generally be preferred by players with lower to moderate swing speeds. THP: Was there an apparent trade-off in playability with the longer shaft in comparison to say a standard 7w or a hybrid? Jeff Newton, Callaway Golf: There might be to a certain extent, but the Heavenwood is surprisingly versatile. THP: It appears that for a 7 wood the head is larger in comparison to some other higher lofted fairway woods. Is that the case and if so what is the reason? Jeff Newton, Callaway Golf: The size of the Heavenwood is similar to a 4w so it’s larger than a traditional 7w. This head size fits better with the longer length and provides the higher MOI needed for added forgiveness. THP: Aside from the higher loft, what contributes to the club’s propensity to produce a high ball flight? Jeff Newton, Callaway Golf: A low and deep center of gravity along with a flatter roll radius on the face also contributes to the higher ball flight. THP: Talk a little bit about the sole design. We know it’s a modern Warbird sole and should be easier to use from any lie, but what are the specific design characteristics that accomplish that? More information on the V Series Heavenwood can be found at www.callawaygolf.com. It retails for $239.99 and comes stock with the Mitsubishi Rayon Bassara E-Series 52 shaft. In addition, you can follow Jeff Newton at @JeffNewtonCG. That was awesome, I had no idea the specs on the original were what they were, I really thought it was a higher loft than the 20. I like the way Callaway is looking back a little while moving to the future, it really shows the way modern technology has evolved. Very interesting read and great questions presented Ryan. This one has definitely found it’s way onto my radar recently. Generally, it is designed for players who struggle to hit lower lofted fairway woods off the ground but are still looking for maximum distance. Nice interview, Ryan. The Heavenwood is unique today as it was then. I think the Heavenwood would fit nicely into many peoples’ bags. I enjoyed this as I didn’t know what made this club so special to many. I definitely need to give this club a go since I traditionally don’t hit lower lofted fairways off the deck too well. Adding that distance in an easier to hit package is intriguing for sure. Great interview. I get along well with the Heavenwood and enjoyed learning the technology behind the club, as well as how it was improved upon from the original. the Heavenwood sounds like a winner to me! Lot’s of good info there. I can’t wait to try this thing. Love the Q and A. Great Interview and interesting reading about the technology behind the Heavenwood. I struggle at times hitting my fairway woods off the deck, so this is an option I may have to look into. I know a lot of people who used the original Heavenwood and loved it. You didn’t hear many complaints about it except from the people who would never play a wood with that much loft! I bet this new version is a winner as well. Thank you for this interview Hawk. I’ve struggled with FW off the deck & almost at the point of completely writing them off. After watching how easy & long you and JB hit this at PGA National I am definitely intrigued. Great read. I gamed the Heavenwood hybrid and liked it. I think the concept of it as a fairway wood is truer to the original and could be a really fun alternative to something like a 4 wood or even 5 wood. Awesome read! Kind of want to look at one of these and give it a workout. Who knows it might be what i need. Thank you for the interview. Previously, Callaway hinted that the Heavenwood is a club for guys who want to carry Driver and 1 fairway — with the fairway being for golfers who have trouble launching lower lofted clubs. I went the opposite way — wanted to know if the 3 wood in the BBV would work before I went to the Heavenwood. I had carried a 4 wd as my only fairway and wasn’t entirely happy with it. The BBV 3 wd surprised me – without much confidence, I got a mid launch that went straight; then I went Heavenwood — and found some inconsistency – sometimes long, sometimes short when the swing/balance was off, and always high. Bought the BBV 5 wd – more consistency. Hit the 3 wood more and found it can get higher than mid launch. In sum, for me the jury is still out on the Heavenwood – might replace a 5 wd, but thinking another shaft might do it …. or I might convert it into a strong 7…. Moral of the story – yes, the Heavenwood is easy to hit at 43 inches and 20.5 – the large head (larger than the 5 wd) will give you confidence. I would demo the entire BBV lineup before deciding. They are not like other fairway lines — very easy to launch and ball go far…..
Great interview, i enjoyed it, never knew it had all of those specs though. Just received my new heaven wood two days ago. Been to the range twice. It’s hard to not hit the bIll dead straight and over 200 yards.